Well, you need not worry about the heat wave anymore; the weather is now much more what we’d expect and we had a touch of frost last night. Mixed sunshine and cloud this morning, with a chilly NW breeze, about 9 degrees celcius at midday, it felt a good deal colder out of the sun. A grey afternoon and then a cold, bright evening, with wonderful light from the North. Water temp is a steady 9-10 degrees on Varzuga (6 on Kitza), the level here dropped 3” last night. Last night the Middle team were in their waders virtually before the rotors stopped turning and there was, I gather, a rush to the water. They landed 34 fresh spring salmon in their first evening! As reported earlier, we took a slightly more relaxed approach here. I asked a guest at breakfast this morning how many he’d had last night – big mistake - he had not fished and thought I was rebuking him re. the whisky consumption. Kitza started well with 30 for the six rods on the opening day, Lee M hit the jack pot with 11 from First Island. Tom had reported that fish were well up the river past camp and this catch was welcome news to confirm this, we can now start to explore further up river. Middle, as always, were a bit behind on reports as half the rods were still out when we at Lower were sitting down to supper. Garth thought they would be over 90 for the day and had heard on the radio that several good fish in the teens had been landed. 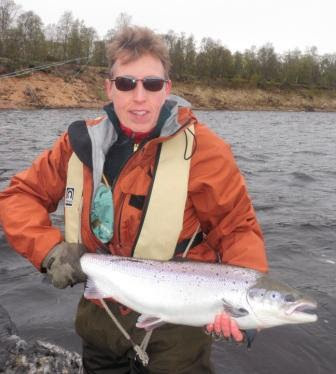 At Lower we had some triumphs , notably Tom C who caught his fist salmon, and then went on to land nine more. He kindly insisted we all celebrated with a large bottle of senior malt. Thank you Tom! We ended up with 43 for the day, a good morning and slightly slower afternoon. As to tackle – we are on the cusp - high water yet at a floating line temperature, the sinking lines are working well, those less able to cast a distance are better off on intermediates or slow sink tips, we are starting to catch them on floating lines. 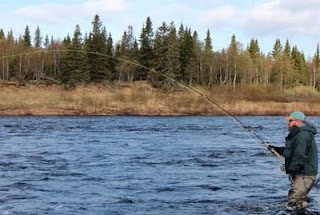 My advice, to all but the best casters, is ‘distance is better than depth’ in these conditions – use a line you can cover water with rather than going deep. More tomorrow; I’ll get you that Middle result and perhaps dwell on the out look for Pana as I know a few of you are getting itchy feet.